I. am. so. excited. about. this!!!!! ﻿Is this not the cutest dang thing ever?! I love owls. I mean, who doesn't right now? But I am old school. I loved owls before they were so cool, lol! I wasn't planning on making this at all, but lately I have been on a mission to get rid of some of my craft supplies. I have so much stuff! Especially yarn, so I have been making all sorts of stuff lately. This purse is a great size for a toddler/preschooler. It would be really easy to make bigger too, just by adding some rounds (you can now find my pattern for the "Owl Stuffie/Pillow" which is an enlarged version of this and could either be made into a stuffie or left open to make a larger purse). Hook Size- H for the body and an F for the eyes and beak. Yarn- I used Lily Sugar and Cream 100%. I think any worsted weight yarn would work. As you can see I used lots of different colors. I think a solid color purse would be adorable as well. Other notes: For this pattern I chose to bring my stitches up through both "loops" of the previous chain (you can see this in the second picture below this sentence). I find doing it this way gives the owl a tighter appearance. Row 1:You have two options here: you can either ch 3, and then 11 hdc in the first chain of the chain 3 (which is what I did to end up with the picture about), or you can do a magic ring, ch 2, 11 hdc in the middle of the ring, pull tight. For either way, join at top of original ch 3 with the new color (Check out 2 pictures down for a better idea. I forgot to take a pic for this round). Row 2: Ch 2, hdc in same space, 2 hdc in each space around (see how I use both "loops" of the previous row instead of using the front or the back? Not sure if this makes sense, just email me if you have questions). Join at the top of the ch 2 with a slip stitch in the new color. Row 3: Ch 2, hdc in same space, *2 hdc in next space, hdc in next space *. Repeat from * to * around. Join at the top of the chain 2 with a slip stitch in the next color. Row 4: Ch 2, hdc in same space, *1 hdc in next space, 1 hdc in next space, 2 hdc in next space*. Repeat from * to * around. 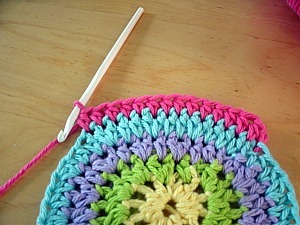 Join in the top of ch 2 with a slip stitch in the next color. 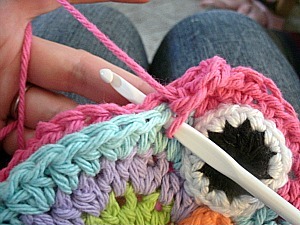 Row 5: ch 2, 1 hdc in next 14 spaces (Check out pic above, this is going to be the top of the purse where the eyes will go). Ch 2, turn your work, 1 hdc in next 14 spaces). That is side 1 of two for your owl. Make another side just like the one you just made. I chose to do the second one in a solid color. For the beak, use your F hook. Do another magic ring, ch 2, 1 hdc, ch 2, 2 hdc, ch 2, 2 hdc into the ring. 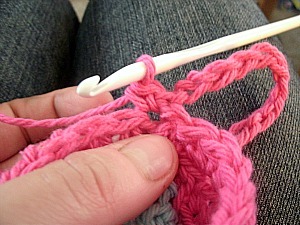 Pull tight and join with a slip stitch in the top of the chain 2. This should give you a little triangle. Now attach your eyes and beak however you want. 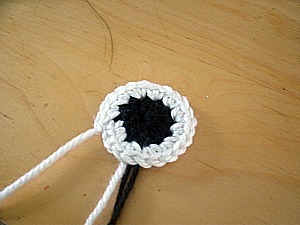 Do this before you attach the two sides of the purse together, it is much easier! 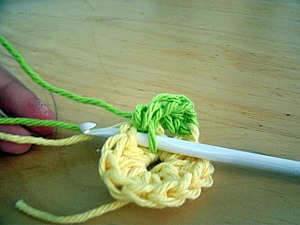 Use a darning needle and some yarn to sew the pieces on. Now join your two "owl sides" wrong sides together. Try to line up them up so they match. You are going to sc around the outside of them to attach them and you want to them to be perfectly lined up. Now stick your hook through both sides, like I have pictured above. YO and pull the yarn through. 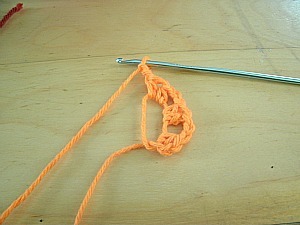 Ch 1, insert your hook into both sides again (like pictured above) and sc. Sc in each space of both sides around. This is where it gets crazy (not really, it is just hard to explain). 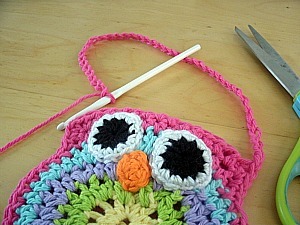 Insert your hook into the opposite top corner of the owl (don't twist the strap). YO and pull though. Turn your work so that you can sc back up and over the strap. Join with a slip stitch next to the 1st of you original 40 chains. Make sense? If not, let me know! Hopefully this is what you ended up with! As you can see, I added some cute little pigtails to the sides of the head. I just used some scrap yarn, pulled them through and tied them. Like I said, if you have any questions, just shoot me an email! 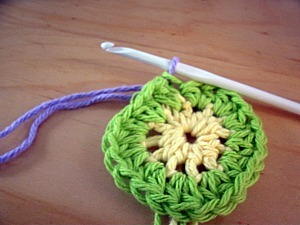 If you liked this pattern you can find more of my free crochet patterns here. Don't forget to follow me on Twitter and Facebook to get updates on my newest patterns! Cool, thanks for sharing. I have a little girl who loves little bags - I now see an owl bag in her future! This is adorable!!! Thanks so much for sharing the pattern -- can't wait to try and make one! I am new to your blog. LOVE IT!! Found it thru tangled blog. This owl bag is precious. I am going to start making the first of 4 today. I am a stay-at-home gramma to 4 little girls, ages 3, 5, 7, & 8 and 2 little boys, ages 4 months & 2. The girls are going to go crazy. Oops, I should have said I found your blog on tangled happy's blog. very cute bag! thank you for sharing! My granddaughter's school mascot is the owl. I look forwrd to make it for her for Easter. Thanks, for sharing. wow, such a great pattern!! thank you for sharing. Love it.. 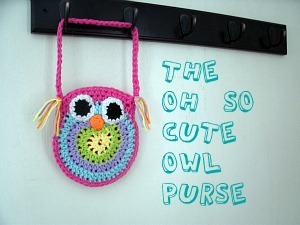 Wonderful:-) Really - it is OH SO CUTE OWL PURSE! Waaaaw, i like this one, thx for sharing this pattern!!!! So very cute, thank you for sharing your pattern! Thank you so much for sharing this! I can't wait to make this for my little girl! It's beautiful! This pattern is way too cute. I can't wait to try this out for my girls! Thank for sharing, I made one myself. I put it on my blog with a link to your blog. Thank you for the pattern, I love owls and this adorable. Thanks for posting such a cute pattern! I made a couple of these purses for gifts and have shared them on my blog. And of course, I linked back to your pattern too! So cute purse. I pinned to my Crocheted & knitted bags pinboard on Pinterest. Thank you so much for sharing, I would love to make and sell these for our epilepsy charity. I hope you do! I hope they sell well! What a lovely idea and what an adorable purse! I'll have to make one for my little baby niece - she is only 14 months but already LOVES to carry purses from one room to the other and changing things to put into, haha, truly girly she is! I wanted to say a belated thank you for your tutorial. I used it to make my twin nieces some purses to match owl hats I made them this past winter. I added two rows to make them a little bigger (the girls are 3). They are super cute, thank you again! totally cute! I'm linking to this over at somedaycrafts.blogspot.com. TY for this. I've decided to leave tge blankets this weekend and make something small...this is it! Great pattern. I've linked to the pattern here for my readers. I actually ended up making this little owl purse today. I've linked to your blog for my readers to see the pattern. TY. how do i make it bigger? Oops, forgot to mention that you will want to make the "head" a little bigger. I would guess that if you add one round, 17 across for the head would be fine. Hi? I'm Lutya, from Russia. I've read all your blog? it's brilliant! The bag is nice, my daughter liked it very much! If you don't mind, I'll knit it for my girl! Thanks for sharing:) i am a norwegian girl, and I love to make things. I made one of these for fun and a friend who has an owl-themed shop up north said I could sell a few in her shop if I wished. Although you said above you now don't mind these purses being sold, I didn't want to do anything without getting in touch first! It would be different colour schemes and probably a couple of different sizes. Hi Thanks for making this pattern so cute and sharing it. I am asking permission to make a purse in tan and blue and a light yellow for my friend's 21 birthday gift and it is great because she is in a sorority called F.A.D. and their iconic symbol is an owl. I hope this is okay, and thank you for being so kind and explaining the steps for excellent understanding. You are so nice!! Thank you very much for sharing this pattern! I made this bag for my little daughter! Thanks for sharing with us this beautiful purse patterns. I love it. Thanks a lot. I like your blog. I just finished my first one! Thank you for such a relatively easy pattern. I'd like to post a picture of my finished purse on the Ravelry website with a link to your instructions. Is that OK? and how do I do that if it is. thank you for not removing your pattern just because of a few 'bad apples'! 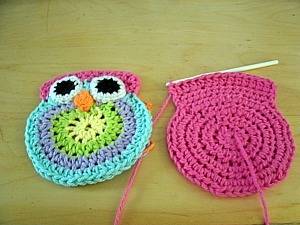 I can't wait to make my own little owlie purse!! Thanks for sharing the pattern. I will make one for my niece as a gift from Santa this year. she is only three years old and love owls. Haven't been on here in awhile but wanted to say thanks for all the kind comments. I am glad you like the pattern!!! 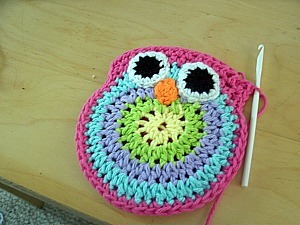 Thanks so much for sharing and letting us use your hoot-astic pattern! My little girl is going to love one of these and I'll be sure and link back to your blog if I put up pictures or anything. Cheers! Thanks so much for this pattern! I just made my first one for a "big sister" present for a friend, and I fall more in love with the purse every time I look at it. Can't wait to make some more! Hi! I was looking for a cute little purse pattern for my 3 year old to give her for Christmas and happened upon your blog, I just wanna say this is so freakin cute! I have already made 2 and plan to make more! shoot, I might even alter it to make it big enough for ME to have one! Anywho, I did a blog post about it, and linked back to your page here. Thank you s much for the pattern and God Bless! I am new to crochet and can't wait to give this a try as a gift to my 7yo and her friend...matching purses...too cute. THANK YOU!!! Thank you so much for sharing this pattern! I just finished making one as a gift and I absolutely love it! :) Have a great day!!! Thank you for sharing this pattern did a few of them in different colors and sold them like hot fries jajaja thanx againg have a great week. I just finished this purse...ADORABLE!!! I added a little tab and button to keep it closed. I also did a slip stitch through the strap to make it a bit stronger. Can't wait to get this too a sweet little girl. Could you do this pattern like lion's brand homespun? I have a color that would be perfect for this. thank you very much for this pattern! hermoso trabajo y buena idea para un lindo regalito hecho con amor!!!! Thank you for sharing the pattern. I LOVE this! I saw you're "Do not sell" change into "yes, you can sell" so I figured it would be polite to ask anyway - Would you mind if I sold some of these at my market stall / my online store? Jessica I am so sorry I missed your comment, yes you may! And thanks for asking. Thank you..going to make this for my granddaughter in Alaska! Thanks for the comments all! Sorry I haven't been able to reply in awhile but I appreciate all the love!!! I'm like you, I've loved Owls since the '70's when we Macramé them. I still do lol THANK YOU for sharing this cutie. PS. What size is this little purse? Thanks Conni! The purse ends up being only 5 in. across I think? Just the right size for a 2-4 year old. 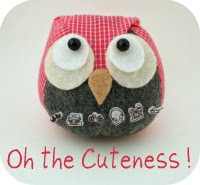 If you want it bigger check out my Owl Stuffie pattern as it's the same pattern but bigger. If you look through the comments, there are some instructions to make it bigger. 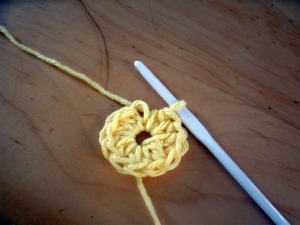 I'm new to crocheting too so it took some time for me to figure it out .. lol, but eventually I got it bigger. Just made th e owl purse in red, white & blue. So cute and easy. Only thing I did different was a double thick purse strap. Thank you! I made it AND IT WAS SO EASY AND SO CUTE!!!!! Thank you for sharing this pattern. I made several colorful granny square blankets during this past summer. I was left with a stash of many colors. I began working in an elementary school and made your owl purse for a little girl. It became all the rage. I took names and color preferences and gave 40 in all and all in a month and a half. The little ones would place their order and come back fifteen minutes later to see if it was done yet. I had some strange color combinations but each child was delighted when presented with their very own purse. I feel I got to know the children by name the quickest way possible. Now the boys are requesting that I make something- not a purse- but something for them. You were very kind.